With this sale ending in one day, you don’t have much time to scoop up a wallet-sized LithiumCard from the folks at LinearFlux. 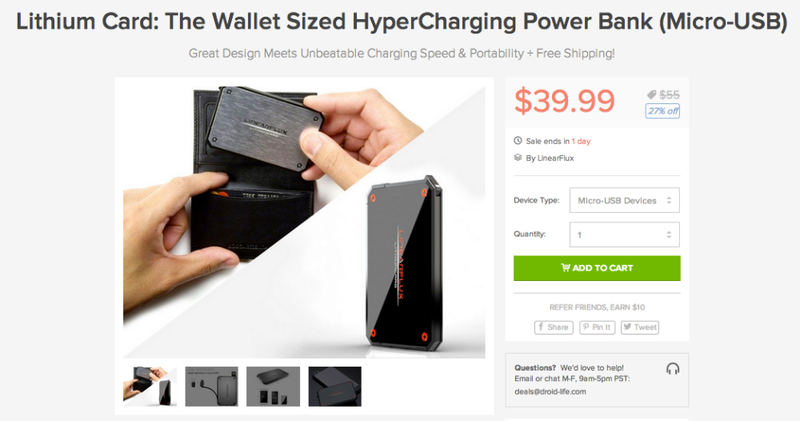 Originally an Indiegogo campaign, this little power bank fits right into your wallet, allowing you to “hypercharge” your devices in no time at all. The bank is in the shape of a credit card, so for men, it should fit neatly into oversized wallets. And ladies, the bank should easily be able to find a home in your purse or tote bag. Featuring either a lightning cable or microUSB charging cables, both Android and iOS users can find a use for the LithiumCard, which retails at $55. However, until the sale ends tomorrow, you can grab one for $39.99, 27% off of the retail price. For highlighted features and the video from the product’s Indiegogo campaign, look below.